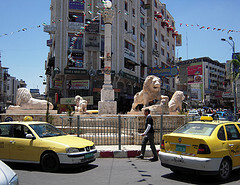 The main square in Ramallah, on the boundary with Ramallah’s sister city, El-Bireh. Some days it feels like I have the best job in the world. This week I had one of those days. For the past several days I’ve been working with our Embassy in Tel Aviv and Consulate General in Jerusalem on their public diplomacy social media programs. This focuses mostly on sharing best practices from other missions, providing suggestions on enhancements, and helping to create a structured approach to their public engagement. This work has been great, fun, and very illuminating. I’m constantly amazed how much our missions are able to do with limited resources and even less time. But that isn’t all that made the day so remarkable. 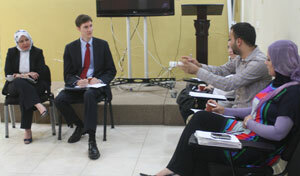 What made the day so noteworthy was the opportunity to chat with Palestinian social media leaders. The Arabic Media Internet Network (AMIN) hosted an in-person session with bloggers and practitioners in the West Bank city of Ramallah and a second video conference with bloggers in Gaza. Merely visiting Ramallah is worth noting on its own. This sounds strange to say, but it seems a very “normal” place. The perception you get of the West Bank is a desperate population riven and cut-off by strife. News images focus on thrown rocks and wire-topped walls. Instead there are bustling streets, car dealerships (including a gleaming Mercedes dealer), and new five-star hotels. The most incongruous feeling was the security detail we are required to have on official visits. It made me feel alien to the outside. I imagine the feeling is mutual when locals see our imposing truck hurtling by. Discussing social media with Palestinian activists, professors, and students. As an outsider, this normality hides the precariousness of the current situation. I was told stories of humiliations at checkpoints, the daily hassles of stateless-citizens, and families and friends separated by ever-shifting lines. Jerusalem itself is a city of walls. They separate the old from the new, east from west, and a troubled past from an uncertain future. Yet there are uplifting stories as well, of tireless videographers showing the real lives of Palestinian women, bloggers working to build bridges between separated people, businessmen creating new opportunities, journalists dedicated to openness and transparency, and photographers sharing the beauty of the landscape and her people. They are using new media to tell their stories, as only they can. While the sessions were billed as a chance to learn from the work we’re doing in the State Department, we have much to learn from them. With luck I will be back in the near future. Until then, there’s always social media to keep us connected!